March 30 I'm at the The Ace of Clubs on 9 Great Jones st downtown at 8:30 with Jan Bell and the Cheap Dates. Hank's ! We get going at 10:30. All you have heard is true about this amazing musical phenominon. 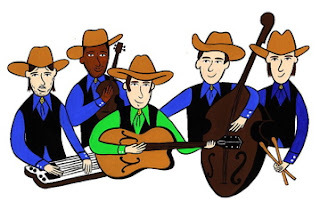 Weds night around 9:00 Smokey's roundup will be playing at Sunny's in Red Hook. I have a new cowboy hat, a fire in my heart and Lucy will be there accepting bribes. Sunny's: 253 Conover st Brooklyn, 11231. Right next to The Fairway in Red Hook. Thurs the 5th Smokey again. This time at Superfine . There is subway access to this fine establishment so no slakin from you slakers out there.